Goku and Naruto. Luffy and Ichigo. Jojo and Kenshiro. It's hard not to be excited about a game where all your favorite Shonen Jump heroes battle it out. Unfortunately, while it does deliver on the fanservice, the novelty wears off painfully fast. The Shonen Jump magazine has been churning out some of the most popular manga for over 45 years. These include classics like Jojo's Bizarre Adventure, Fist of the North Star, and Dragon Ball—as well as more modern hits like Naruto, Bleach, and Toriko. 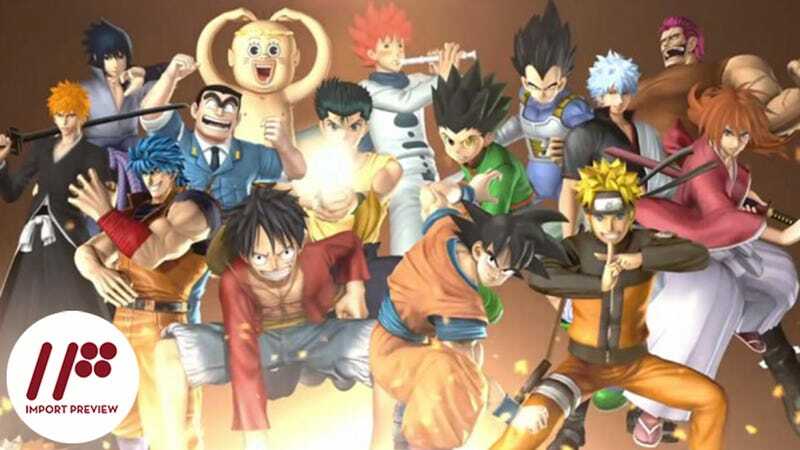 J-Stars is a celebration of the magazine's rich history and features 52 characters from across 32 different series. In other words, this is a game where Luffy (One Piece) can team up with Kenshin (Rurouni Kenshin) and Alan Walker (D. Gray-man) to fight Gintoki (Gintama), Seiya (Saint Seiya), and Lala (To Love-Ru). If you have favorite Shonen Jump characters, there is a good chance they're in this game. Perhaps the best element of the game is how the characters function in battle. None of the characters are mere pallet swaps—they are all unique. Each character's move set comes directly from his or her respective manga. This ranges from normal punches to the devastating special attacks. So if you pick, for example, Goku, you will be able to do everything from a Kamehameha to going Super Sayian. On the other hand if you play as Luffy, you'll have a myriad of stretching attacks and a longer reach. It's fanservice of the best kind, pure and simple. If you've dreamed of playing as any of the Jump characters, you won't be disappointed with the experience. J-Stars has four versions of the story mode centered around a different anime's characters—those of One Piece, Toriko, Bleach, and Naruto. The one you choose results in an automatic selection of your starting team as well as the lead characters for the game’s conversation scenes. From that point on, you go around “Jump World” exploring various locales from the source manga. Each time you visit one of these locations you'll encounter characters from other Jump series and be treated to a short, often cute conversation. These conversations inevitably end in one of two ways: You are given a quest or you begin a fight. However, as cute as these conversations are, they have no real substance—nor does the game have any meaningful overarching plot. The story cutscenes are just fanservice—and as the conversations are not voiced beyond a few generic phrases, it's relatively poor fanservice at that. Unfortunately, while the characters and their respective movesets are unique, they all play basically the same. Each character has strong and weak attacks that can be chained into various combos. Some knock opponents to the ground while others send them flying. Each character also has a dodge and a dash that, while different-looking, play exactly the same. Thus, the fighting is far from complex. In fact, one simple strategy works regardless of who you are playing or who you are playing against. When the enemy attacks, you block. After the last hit in his or her combo, you counter with your own combo. Then you block again while your opponent, invincible until fully upright, gets up. Rinse and repeat. With some characters, it's even easier. Boa Hancock has a Chun-Li-style lightning kick. After knocking down an opponent, you just lightning kick over your opponent's prone body. By the time the character gets up and loses his or her invulnerability, your kick will still be going on, knocking that character right back down. Due to the simplicity of the fighting and the one-strategy-fits-all nature of the game, the battles quickly become monotonous—and eventually outright boring. By an hour in, the only time you should ever take damage is when you are blindsided by your opponent's partner. J-Star Victory VS is fanservice, fanservice, and nothing but fanservice. The gameplay is largely forgettable and so is the lackluster attempt at a story. The only reason to play this game is if you are a fan of the source material—i.e., Shonen Jump manga. And make no mistake, on that level, the game shines. It is clear the designers painstakingly recreated the various characters so they would be as true to their respective manga as possible. If you are looking to play as your favorite Jump characters and bring your dream matches a bit closer to reality, then this is the game for you. If you are looking for an enjoyable fighter, however, it is best to look elsewhere. J-Stars Victory VS was released in Japan on March 19, 2014, for the PlayStation 3 and PlayStation Vita. There is currently no word on an international release.